Climbing is primarily a head game; that moment of thrilling panic, as your breathe deepens and you face the only option, commit or fall. Crossing that line in the sand and facing life at its most primal, fight or flight! In that moment it’s not your strength or fitness that will get you through that dark alley, but your mind. Today, at the crag, you believe. You believe that you can do this, you’ve been climbing well all day. Each route a step up on the last one, and now you feel ready for the next step, the next grade. You choose a route you saw someone lead before and you know there’s gear up there somewhere. A distant voice says ‘go for it’ as your stomach sinks with excitement. At that moment you move on and discover a new place, that ephemeral moment. Does this sound familiar? If it doesn’t maybe you aren’t reaching your true potential. Why? This first situation could be numerous times in mine or others climbing careers. It is of course a totally fictitious event, however it was made up to highlight how self belief, self confidence and self efficacy can have a powerful effect our climbing performance. Bandurra has done a lot of research into efficacy and its effect on all sorts of situations and outcomes, be it social, work and even sporting. In sports it has been shown that someone beliefs in how they engage in their sport has had up to a 40% effect in the final outcome. So how confident we feel at that precise moment of commitment is linked to the amount of effort and persistence we put into the climb, how we think about the climb, our emotional reactions and of course the outcome of the climb, be it success or failure. As well as its effect on performance Bandurra identified four main building blocks that can increase our belief in our own ability to succeed in a given task, be that climbing a given route or performing well in an interview. These components have differing levels of effect on our self-efficacy, or confidence in climbing. Our prior performances in climbing have the greatest effect on our confidence and this increased confidence in turn improves climbing performance. The next most influential way to improve our confidence is witnessing others climb, ideally on the same route or a route of similar grade, after this some kind of verbal persuasion can have an effect on our confidence and finally just how scared we are by the challenge we face. How then do you use these building blocks of confidence in climbing, well first of all go back and read the second paragraph, it sums up a best set of circumstances, which can be looked at via our four building blocks. Prior Performance …you’ve been climbing well all day. Each route a step up on the last one…. 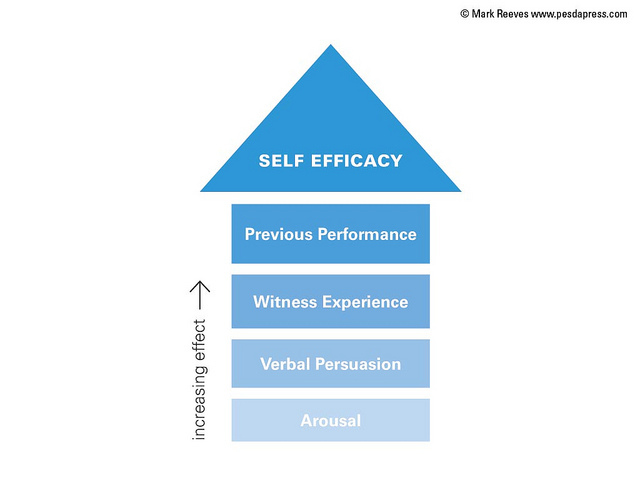 The building blocks of self efficacy. We all have good days and bad days on the crag, the trick is to realise what day it is today. If it’s a bad day, then perhaps rationalise it. Maybe you were up late drinking, partying or even working the day before. You might not have climbed for a month or you have been climbed continuously for over a week, and are just run down, or maybe you have had an argument with a loved one and your mind is elsewhere. Whatever it is there is probably a straight-forward reason why you are not on the top of your game. Similarly you may be having a great day, for the opposite reason listed above. Whether a good or bad day look at it rationally. The easiest way to work on prior performance is to actually get on the rock, and maybe climb a familiar route, or a route that is within your grade, so that you can find the positives. You placed gear well, you read the route perfectly, you found the rests and that you enjoyed the route. If you had a negative experience remember to rationalise, you might not have made first time runner placements to start with but by the top of the climb had you improved? Can this improvement be carried onto the next route. Also are you using a steady progression of climbs from the difficulty, boldness, rock type or rock angle? So whilst you might well be good on E5 slate slabs, pulling onto a Tremadog E3 might be a totally different kettle of fish. The key is progression on all types, styles and difficulty of routes. Other ways to utilise prior performance is to use your memories of the last great day you had climbing. In sport it is referred to as imagery, so the night before you head out climbing spend 15 minutes remembering the crags, the climbing, the feelings and emotions of your last great day climbing. In climbing this may be simply having seen another unknown climber ascend a route, in your mind you will measure yourself against that person and if you believe you can climb as well as them, a switch in your mind will have a strengthened belief in your ability to succeed on that route or one of a similar grade. You might see where the gear is, or where the crux is and how to climb it. Where this witness experience becomes most powerful is when you climb with a well known climbing partner, and someone that you can more easily judge their performance against yours. It may sound rather self centred, but if you see a friend climb a boulder problem or route, and you believe in your mind that you can climb at a similar standard, there will be a much bigger increase in your confidence to climb that route or boulder problem. Try experimenting next time you are climbing at your local wall, go round the bouldering wall trying routes that you can’t climb first go. If you climb with someone who is about your equal, and they climb it first, the chances are you’ll climb it shortly after and vice versa for your partner. Verbal persuasion can come from you, your belayer and bystanders. All will have an effect on you, and more commonly an effect whilst you are climbing rather than before or after. The trick is to keep everything positive, although telling someone or yourself to go for it on a really run out ‘chop’ route needs very careful consideration, especially if they are pushing their grade. Confidence is often knocked back when you’re climbing by an inner voice, sport psychologists call this self talk. ‘The runners are poor’, ‘the climbings too hard’, ‘I am going to fall’, ‘I am scared’ or any other form of negative thought. Here as a belayer, bystander or climber you need to be able to combat the negative thoughts by either replacing them with positive thoughts or even better reframing them with a rationale explanation and counter argument. Often by imagining yourself in a climbers shoes you can help choose the right thing to say at the right time. I can do this – not I can’t. This looks OK- not this looks impossible. I am going to succeed – not I am not going to fail. The gear is excellent – not the gear is OK. I will give it 110% – not I can’t do this or it’s too hard. I might succeed – not I might fall off. I feel great – not I feel OK. The gear is bad – The last runner below that was a good one. The move is impossible – Have a shake out on that rest, take a couple of minutes breather to relax and have another look. This looks pumpy – It looks like the gear is good, and if you climb it quickly it slabs off, so you’ll get a good rest above. Its really bold – you’ve done all right so far, relax on those holds for a moment and then take it nice and steady to the top. I’m scared – The gear is just below you feet, and it’s good, take a few deep breaths, calm down and see how it looks. Often these negative thoughts can be re-occurring, in that the same thoughts will crop up time and again when you climb. Take time when you have climbed a route to think about what negative thoughts you have had, when and where on the route, maybe take a notebook to the crag and write down those thoughts over a number of days climbing, when you are back home try and rationalise those thoughts and find ways to re-frame them as positive thoughts. 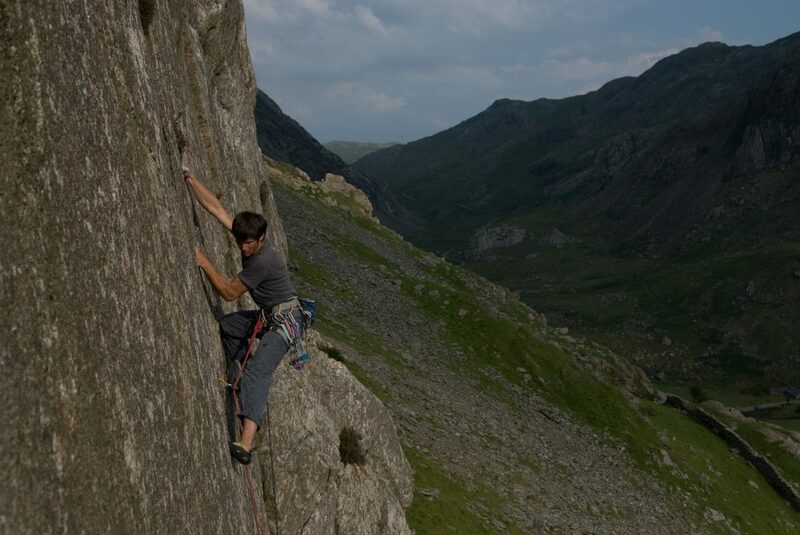 Dave Rudkin confidently climbing Too Hard For Jim Perrin, E1, in Llanberis Pass. 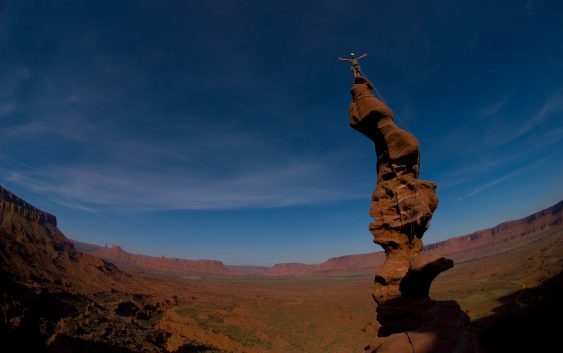 In the context of sport this is the effect that adrenaline and the mind can have combined. This anxiety has both physiological and mental effects. The physiological side is often experienced as feeling gittery, sweaty palms, a sinking feeling in you stomach, increased breathing and increased heart rate. How we interpret them is another matter, some people thrive of the effects of adrenaline, whilst some people become overwhelmed by it. Often accepting these side effects and seeing them as positive or learning ways to reduce their effects can help our performance. Similarly these bodily feelings can have a direct effect on our thoughts, as the adrenaline surges so do those negative thoughts. I have mentioned how to combat those in the above section of verbal persuasion. However in the context of arousal it is often beneficial to have a relaxation strategy to combat the racing heart and breathing, and a mantra like re-lax to help free the mind of worry. To accomplish this at home practice slow and controlled breathing, see if you can reduce you heart rate by around 10 beats a minute. At the same time as the controlled breathing use the mantra, ‘re’ as you inhale and then ‘lax’ as you exhale. There are many hypotheses that link arousal and performance, most predict a catastrophic drop in performance. Often looking at our brains ability to process information as a limiting factor. One hypothesises that as our mind becomes overloaded we stop climbing intuitively, instead we have to think through every move in intricate detail, effectively becoming a total beginner, often referred to in other sports as ‘choking’ or ‘Paralysis by Analysis’. Another sees it as a simple decline in mental processes, that we fight to overcome by an increase in physical effort, most simply described in climbing as ‘gripped’. Here we are pulling unnecessarily hard on holds and increasing the likelihood of becoming total pumped and reaching failure. Whatever happens staying relaxed, is key, but interestingly higher levels of confidence helps combat the effects of negative arousal, as such all the other aspects of confidence building help to counteract these negative effects. By using these four building blocks as a framework to address your confidence you will find that over time, and sadly there is no substitute for hard work and time, that as well as physiological advancements in your ability, you will also increase your confidence in climbing, which has been linked in numerous studies to an increase in actual performance.